It is often said that a picture tells a thousand words. In this case, perhaps a few less, but it does tell multiple and layered stories. First, as shown by this image, one of the plant ID characteristics of elm (Ulmus) leaves is the uneven base to the leaf blade as shown here. This was the main point for the attendees at a recent Name That Tree program of OSU Extension at the OSU Mansfield campus. 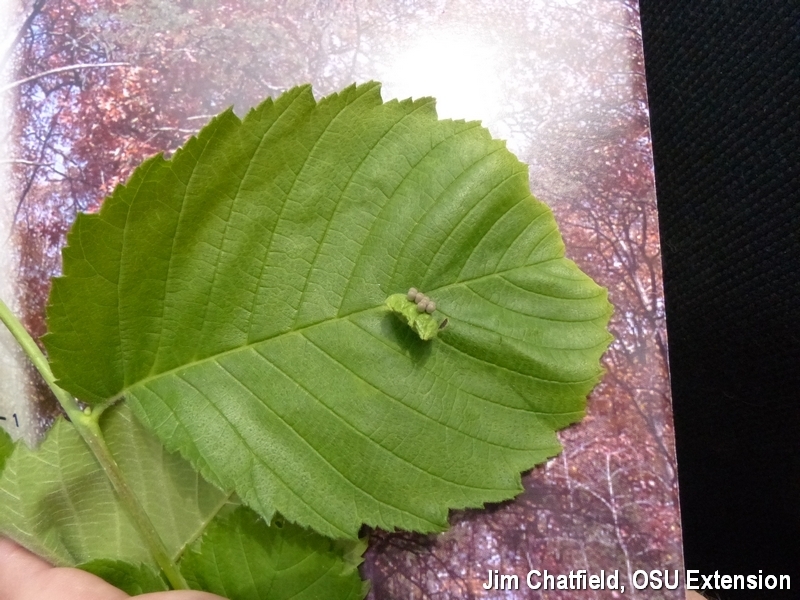 Secondly, of all the gall, the elm cockscomb gall insect (Colopha ulmicola) induced the DNA of this elm leaf to produce a proud new home for the insect’s progeny. Thirdly, although we have not confirmed this, we suspect that the little tubular growths on the gall are perhaps cocoons of a parasitic wasp, awaiting the developing elm cockscomb gall insects inside. Nature in all of its multilayered gall-ory.